November Update | Hampton Industrial Services, Inc.
2015 is coming to an end, but the busy season for Hampton Industrial Services, Inc is not ending! This year has taken us coast to coast and almost everywhere in between! There was an opportunity for Doug to attend a trade show and visit a manufacturing facility with The Haire Group in China. He gained a lot of insight and had the opportunity to network with some key people in the industry. It was certainly a once in a lifetime experience that will not be forgotten. Back at home our crews worked with our customers on installations of Apstars, spent months working in California for the set-up of a new corrugated facility for US Corrugated-Los Angeles which they are finishing now, plus several other installations, relocations and removals in the Greater Los Angeles area. 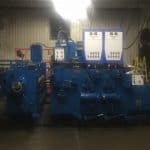 Our in-town staff even got in on the travel with work in the Chicago area and also in Ohio helping with the installation of a machine that they reconditioned in our Granger, Indiana facility. The traveling crews will end the year working closer to home on both coasts of Michigan. 2016 looks to be just as busy with work scheduled preliminarily out to June and July. The calendar is full for December and is filling up for January through May. Because the job list is growing, Hampton’s has added some new staff. They are new to us, but very experienced in this industry. One of our recent additions is Daniel who brings PLC Logic and programming experience and skill and is a very welcome addition. We are always looking for this type of talent, and have been very fortunate to add Daniel to our work family, along with Tom and Michael who bring their own skill base and make our company’s offering to our customers stronger. It’s a great time to be in the corrugated industry!